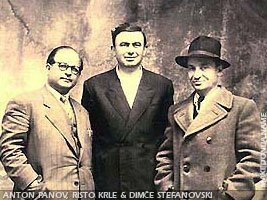 Risto Krle is one of the three Macedonian drama writers from the period between the first and the second world war. Risto Krle was born in Struga, in a family of a shoe maker, in the year 1900. Risto Krle went in school a short period of his life, with plenty stops. Until the first Balkan war he had finished primary school and first class of the secondary. Under Bulgarian occupation he finished another class in secondary school. After his father died, he stopped visiting school and started to work very young. After the first world war Risto Krle followed his father's life and became a shoe maker. During the start of the activity of the cultural-artistic group Crni Drim from Struga, Risto Krle was one the first participants of that group. Full 4 years of his life he spent with amateur activity as an actor and this work inspired him to start writing drama texts. But, Risto Krle's wish didn't come true at first because in 1925, he went to live in Pogradec (city on the shore of lake of Ohrid, Albania, populated by Macedonians) and there he used to work as shoe maker again, where he got inspired to write the drama "Parite se otepuvacka". In 1926 he came back in Struga, his hometown, where he opened a shoe shop, but soon he was forced to shut it down. Short period of his life he worked in Skopje and Belgrade. After the second world war he worked again in Skopje. Long period of his life, till his death he was member of the Macedonian Society of Writers. Risto Krle died at age of 75 years in Skopje. His famous arts are "Parite se otepuvacka", "Antica" and "Milioni macenici".